The meeting will be held in “The Cabin,” a separate building north of the main church building. Be sure to park in the lot north of the church building to enter The Cabin there. Rich Preheim recently completed a history of Indiana-Michigan Mennonite Conference. In Pursuit of Faithfulness: Conviction, Conflict and Compromise in the Indiana-Michigan Mennonite Conference was published by MennoMedia. 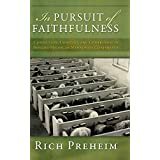 Preheim will discuss themes from his book. Then, the money will go to you. Then also write those initials at the bottom of the card. Price must be in dollar bills, NOT any coins. Bundle books if you need to create a $1 item. Keep price low to encourage exchange. At the end of the morning, 11:45, collect money and/or leftover books. You may want to offer leftover books to Northern Indiana Amish Library or Mennonite Historical Library.